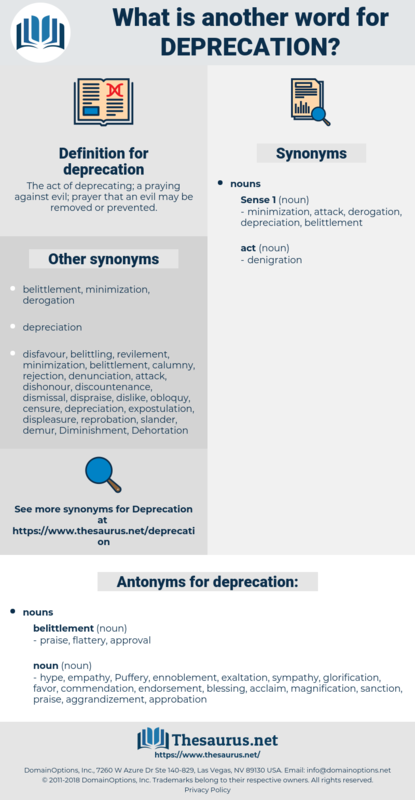 What is another word for deprecation? The act of deprecating; a praying against evil; prayer that an evil may be removed or prevented. approbation, magnification, aggrandizement, glorification, favor, acclaim, blessing, sanction, ennoblement, sympathy, commendation, hype, exaltation, empathy, Puffery, endorsement. Soligen chuckled abruptly, and as though in self - deprecation.
" Still he is your husband," was all Barbara could, with deprecation, again plead. 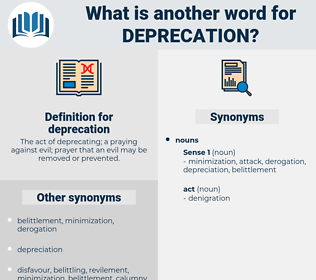 divorced man, depreciation, diffraction, debarkation, divarication, deforestation.